HELLOWEEN are one of the most influential and internationally successful acts of the global metal scene. 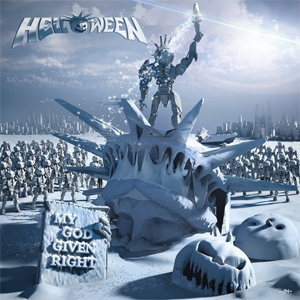 With the release of their 15th studio album My God-Given Right, due out on June 2nd in North America, the pumpkin heads are set to further cement their title as the founding fathers of German melodic speed metal. The band's first self-titled EP was released in 1985, making their new album My God-Given Right the celebratory marker for their impressive 30 year career. "The Swing Of A Fallen World"
"If God Loves Rock ‘n’ Roll"
"I Wish I Were There"
My God-Given Right was recorded between October 2014 and February 2015 at the band’s very own MiSueno Studio in Tenerife with long-term producer Charlie Bauerfeind (BLIND GUARDIAN, HAMMERFALL) handling production and recording duties. The enchanting artwork was once again created by graphic guru Martin Häusler (BON JOVI, QUEEN, GOTTHARD).